The 9th annual Back to School Bash will be held on Tuesday, August 8, 2017 from 6 p.m. to 8:30 p.m. at The DoSeum, 2800 Broadway, San Antonio, TX. This free family-friendly event promises to provide fun and educational activities for children. The Bash includes sensory stations for children, educational activities and a special appearance by Peg + Cat! Free admission into the The DoSeum will be given for those attending the event, but registration is required. Parents will have an opportunity to visit informational tables sponsored by non-profit organizations and community partners. 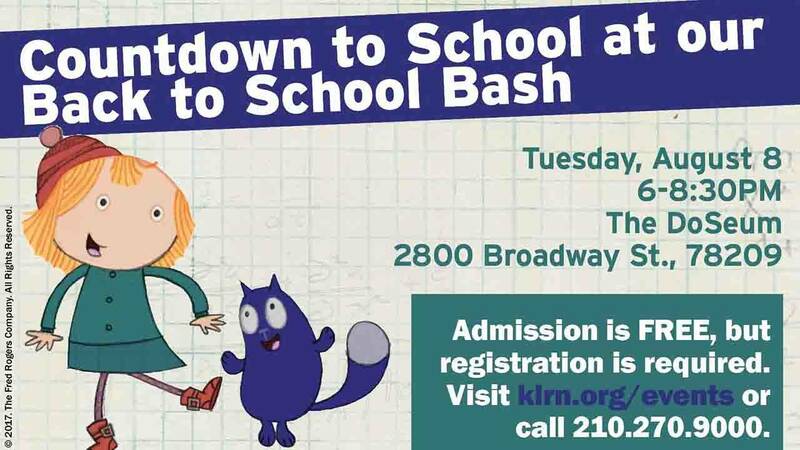 WHAT: Countdown to School at our Back to School Bash with Peg + Cat! WHEN: Tuesday, August 8, 2017 | 6 p.m. - 8:30 p.m.
San Antonio’s museum for kids is one of the leading children’s museums in the nation. A place where children learn by doing, The DoSeum offers innovative exhibits and experiences to get children excited about concepts in science, math, art and literacy and encourages them to take that excitement into the world. For more information, visit TheDoSeum.org.